The San Jose Blog: New Alchemy Museum Coming to San Jose in 2015! New Alchemy Museum Coming to San Jose in 2015! One of my Wednesday Wishlists ages ago was to see more museums in San Jose. They contribute to tourism, the economy, and provide new educational opportunities for local residents. In 2013 not one, but two major museums were announced. The first was the Italian Heritage Museum in the burgeoning Little Italy neighborhood Downtown. The second is going to be the largest Alchemy Museum in the world! 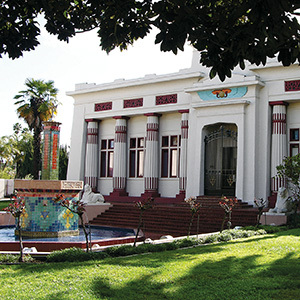 The RoseCroix University building next to the Rosicrucian Egyptian Museum will be converted to a full-blown Alchemy Museum in 2015. Since alchemy is thought to have originated in ancient Egypt, this seems like an ideal location. To top it off, there will be interactive exhibits, lectures, a working alchemy lab, and an auditorium for events. Apparently this will be the only facility of its kind in the US. You will be able to get a sneak preview of this new project at the Egyptian Museum next summer. The Rosicrucians are planning a special alchemy exhibit to promote the new museum, which is again due out in 2015. This is fun news for San Jose. But what I really want to know is -- what does a "working" alchemy lab entail? ?